Get ready to personalize your Ring Pop® lollipops. Bazooka Candy Brands, a division of the Topps Company, Inc., will now offer a way to customize America’s favorite wearable candy with My Ring Pop™. 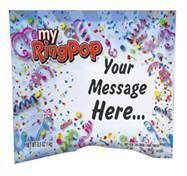 Launching today, the new e-commerce site, myringpop.com, will allow consumers to personalize their pops with a unique wrapper and message for any event or occasion. My Ring Pop™ is the long-awaited solution for consumers looking for the perfect party favor to make every party pop. For the first time, My Ring Pop™ will allow Ring Pop® fans to choose the flavor, color, and wrapper design for their very own edible bling with a choice of birthday, wedding, and general celebration themed wrappers. Included in the purchase, fans can print personalized messages on the wrappers to share a sweet note along with their sweet treat. The flavor selection includes Ring Pop® brand top sellers Strawberry, Cherry, Blue Raspberry, and Watermelon, and ordering options are conveniently available in perfectly party-sized increments of 25 Ring Pops®, up to 500. To provide ideas on ways to incorporate Ring Pops into any event, the site also offers dozens of inspiring pictures, articles and much more from real consumers. I know I grew up with Ring Pops and my kids now love them as well! This new My Ring Pop gives you the opportunity to really personalize your party favors. Still the great tasting ring pops you are familiar with, just the great new opportunity to really make them your own! We reviewed 3 ring pops for fun, and of course my blue mouthed children loved the Blue Raspberry sample! Stop by My Ring Pop online to see the different selections you can choose from, and start customizing your order for your next big party!